Hundreds of Mayfair High students, families, staff and community members waved blue and white flags at Ron Yary Stadium to honor Mayfair’s head football coach Derek Bedell as the Los Angeles Charges L.A. County Coach of the Week during the school’s homecoming game on Oct. 6. 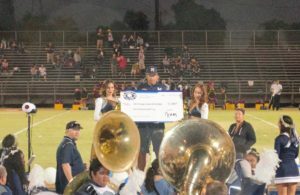 The school’s band played a celebratory number as Chargers cheerleaders greeted Bedell on center stage with a $1,000 check. He was recognized for his team’s first victory since 2006 in the annual Milk Bucket matchup against rival Lakewood High School on Sept. 8. 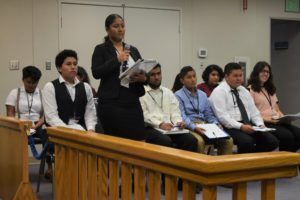 Bellflower High School on Oct. 5 launched a Teen Court program, a new element of the school's award-winning civics program that allows students to explore California's court system. The launch began with a reception that included Bellflower Unified Board of Education members, City Council members, judges, attorneys and other dignitaries at the District Office. Bellflower Unified's Washington Elementary School has received a $5,000 grant from the Barona Band of Mission Indians that will benefit the school's new dual-language immersion program. 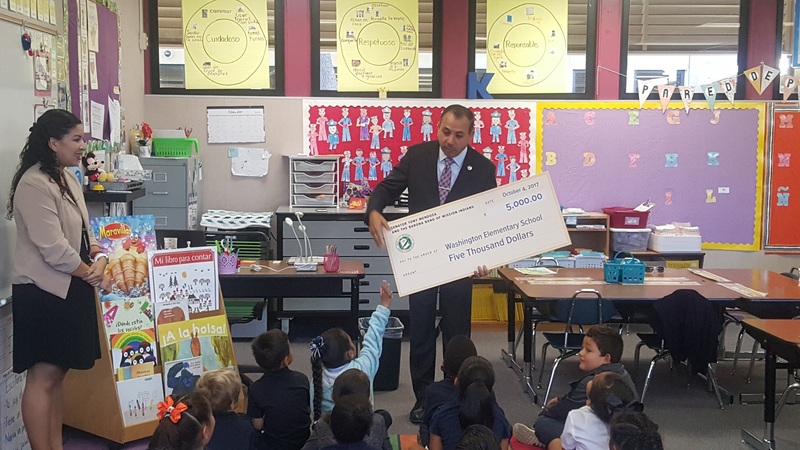 The school was chosen for the award by state Sen. Tony Mendoza, who delivered the grant during a visit to school on Oct. 4. The roots of the Bellflower Unified School District stretch back to 1909, when the Somerset School District was formed in the region. The school was one of the main draws for settlers. The school served thousands of students in various incarnations until its demolition in 1951, the same year the community saw the construction of Bellflower High School. The unified school district was formed in 1957. The district operates 10 elementary schools, three high schools, a home study program and a child development center. Follow-up Story: Hundreds of Mayfair High students, families, staff and community members waved blue and white flags at Ron Yary Stadium to honor Mayfair’s head football coach Derek Bedell as the Los Angeles Charges L.A. County Coach of the Week during the school’s homecoming game on Oct. 6. 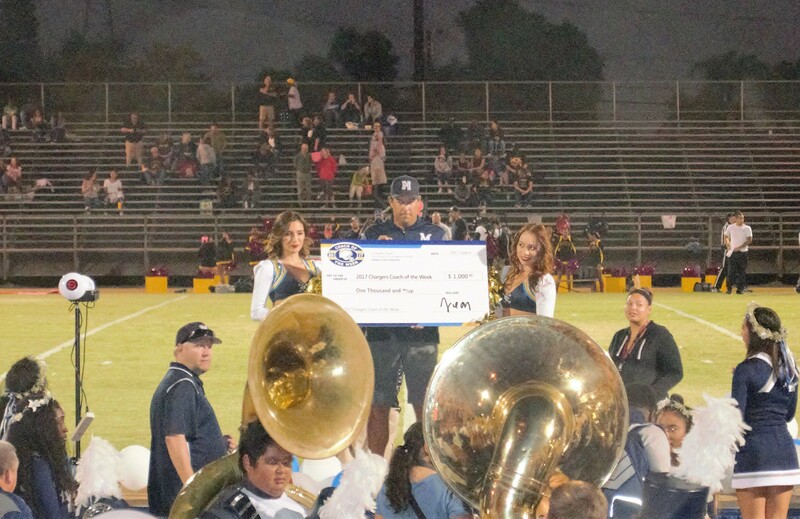 The school’s band played a celebratory number as Chargers cheerleaders greeted Bedell on center stage with a $1,000 check. He was recognized for his team’s first victory since 2006 in the annual Milk Bucket matchup against rival Lakewood High School on Sept. 8. Follow-up Story: Bellflower High School on Oct. 5 launched a Teen Court program, a new element of the school's award-winning civics program that allows students to explore California's court system. The launch began with a reception that included Bellflower Unified Board of Education members, City Council members, judges, attorneys and other dignitaries at the District Office. Photos are available. Follow-up Story: Bellflower Unified students continue to perform strongly on the state’s English language arts and math proficiency tests, with students showing year-over-year advances in 2017 across all tested grade levels. The two standardized tests, introduced in 2015, are computer-adaptive exams that focus on writing and critical-thinking skills aligned with the rigorous California Standards. Already, Bellflower Unified has used the state data to generate a year-over-year picture to track performance by grade level, showing that as students advance each year, they top their performances of the year before. Overall, 47.9 percent of Bellflower students tested as proficient in English language arts (ELA) and 29.1 percent were proficient in math – results on par with or incrementally exceeding the District’s 2016 results, which in turn topped the District’s 2015 performance. English learners who have been reclassified as Fluent English Proficient scored at 74.1 percent proficient in ELA and 41.1 percent proficient in math. 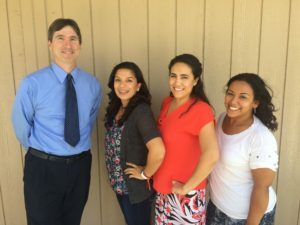 Follow-up Story: Bellflower Unified's Washington Elementary School has received a $5,000 grant from the Barona Band of Mission Indians that will benefit the school's new dual-language immersion program. 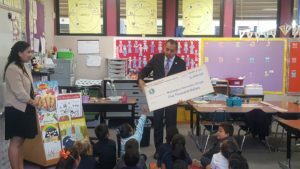 The school was chosen for the award by state Sen. Tony Mendoza, who delivered the grant during a visit to school on Oct. 4. 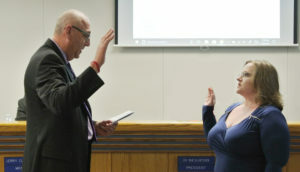 Bellflower resident Hannah Flanagan-Flores was sworn in Sept. 7 as the newest member of the Bellflower Unified Board of Education, replacing retired board member Dr. Paul Helzer. Flanagan-Flores has served on the PTA Council and the Measure BB Citizens Oversight Committee, and has been a parent advisory member. She is a graduate of California State University, Los Angeles, and holds a Bachelor of Arts in sociology with a minor in law. She works in communications as an outreach associate. The Board of Education decided to make the provisional appointment after the July retirement of Dr. Paul Helzer, who served for 16 years. Her term will run through the November 2018 election. Washington Elementary School welcomed 745 K-6 students for the first day of the 2017-18 school year on Aug. 28, a day that also marked the inaugural year for the school’s Spanish-English dual-immersion kindergarten class. Washington Elementary's dual-immersion class aims to provide classroom instruction in both languages to promote bilingualism and biliteracy in younger students for life-long learning and cultural understanding. The academic offering builds on a dual-immersion program launched at the Intensive Learning Center five years ago. Bellflower resident Janea Albright said she enrolled her daughter, Riley, in the dual-immersion program because she believes in the value of learning new cultures and languages. The dual-immersion class was so popular that it not only reached its registration limit of 24 students -- it also has students on a waiting list. Bellflower Unified’s Board of Education will select a new member at 6:30 p.m. Thursday, Aug. 31 during a special meeting at the District Office, 16703 S. Clark Ave., Bellflower. Prior to the selection, board members will interview applicants for the provisional appointment. The new member will serve until the November 2018 election, completing the term of Paul Helzer, who retired on July 14. 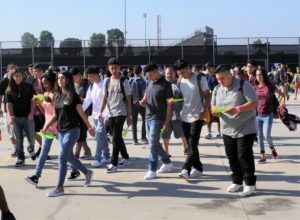 Follow-up Story: Bellflower Unified welcomed back more than 12,000 students on Aug. 28 with a growing slate of career technical programs, renovated athletic fields and a Spanish-English dual-language immersion program expanded to Washington Elementary School. The immersion program’s surging popularity has also driven expansion at its original site, the Intensive Learning Center, which added a third class in kindergarten and first grade. 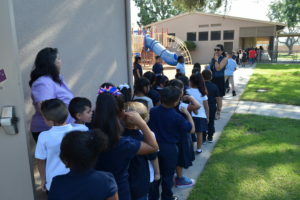 Bellflower Unified’s dual-language immersion program is adding fourth-grade instruction at its home campus this fall as well as adding a new kindergarten class at a second school in the District. Classes begin on Monday, Aug. 28. The expansions are a recognition of surging parent interest in Spanish-English dual-immersion instruction. In March, Bellflower Unified families lined up around the Intensive Learning Center (ILC) up at 2 a.m. to register students. The school, which launched the program five years ago, filled all 72 kindergarten spaces in just a day and a half. The second location, at Washington Elementary School, quickly filled its single kindergarten class and started a waiting list. Both campuses also offer dual-language instruction for preschool students launched in 2016-17. Bellflower Unified is seeking applicants to fill a Board of Education seat being vacated by Dr. Paul Helzer, who announced his retirement after serving 15 years on the board. The appointee will serve until the November 2018 election. Applications are available at the Superintendent’s Office, 16703 S. Clark Ave., Bellflower. They are due by 4:30 p.m. Monday, Aug. 14.